The unincorporated community of Carlyle is at mile marker 104.3. It features a trailhead with restrooms, a self-pay permit station, picnic tables, and parking. 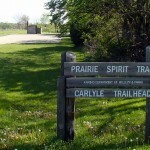 There are no additional services in Carlyle, though there are several points of interest nearby. The trail between Colony and Carlyle is one of the steeper grades of the trail. If you are heading north you will find the wooded area fairly level, but as you pass underneath the Highway 169 the grade increases significantly. You will be in the open the rest of the way to Colony. Take a little time to admire the rolling high prairie all the way to the horizon. The short hop from Carlyle to Iola features some nice farms on either side of the trail which can be spotted through the trees. Most notable along this stretch is a long bridge over two intersecting roads and a stream. The roads are made to be easily floodable during a heavy rain. Once you hit the city limits of Iola the trail is paved. The rider will quickly notice the differences in the surfaces if this is the end of a long ride.